The widow of a Kent Air Ambulance pilot killed when the aircraft crashed has won her battle to clear his name. Graham Budden died along with two paramedics when the helicopter flew into power lines as it was returning to Rochester Airport in July 1998. Linda Budden, from Surrey, brought the civil action after her husband's employers denied liability. The High Court has ruled the aircraft suffered mechanical failure and that Mr Budden, 40, was not to blame. At the time of the incident air accident investigators were unable to establish the cause of the crash because the helicopter was almost completely destroyed when it exploded on impact. It had been suggested that Mr Budden had caused the accident by flying low "for fun". 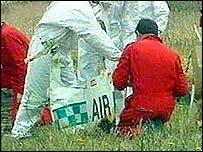 But this had been dismissed by the Air Accident Investigation Branch because there was no evidence to support it. Now the High Court in Manchester has ruled the most likely cause of the crash was a mechanical malfunction. Mrs Budden, from Lingfield, said: "We are just ecstatic that it is all over and that it is finished and Graham's name has been cleared. "It has been an incredibly long six years since the accident. "We were sure there was some sort of mechanical failure but of course there was no evidence because it was all burnt." Mrs Budden, who has two children, said her husband was very safety conscious and had radioed in to say he was going to land when the crash happened. She said: "We knew there was something wrong and we wanted to put the record straight. "I wanted to do it for the children really." The amount of compensation to be paid by the Police Aviation Services, Mr Budden's employers, will be set in the future. Tony Richardson, 47, and Mark Darby, 37, were the two paramedics killed in the crash.